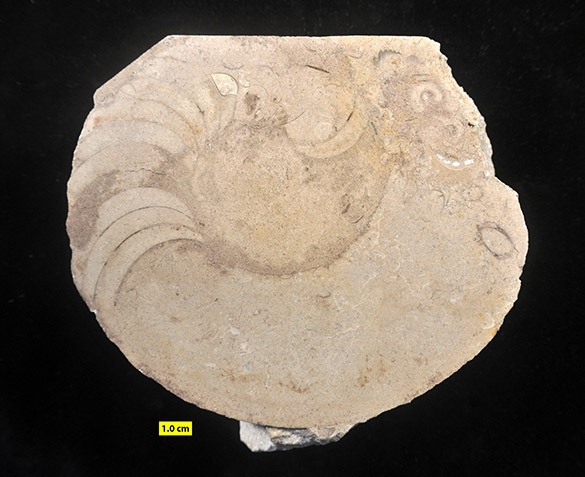 The above fossil is a nautiloid cut in cross-section, showing the large body chamber at the bottom and behind it to the left and above the phragmocone, or chambered portion of the conch (shell). 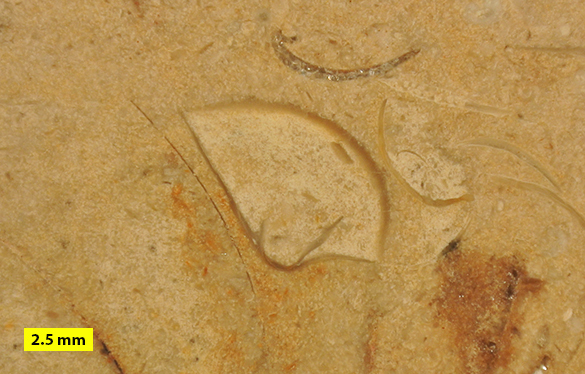 It is a species of Goldringia Flower, 1945, found in the Columbus Limestone (Middle Devonian, Eifelian) exposed in the Owen Stone Quarry near Delaware, Ohio. It is a nice specimen for both what it shows us about a kind of nautiloid coiling and for clues to its preservation. This specimen was originally labelled Gyroceras cyclops Hall, 1861. In 1945, Rousseau Flower designated this taxon the type species of Goldringia. I can’t tell if we really have G. cyclops here or some other species, so I’m leaving it at the genus level. The old name lingers, though, in the term for this kind of open coiling: gyroceraconic. It is one of the earliest examples of the nautiloids having the phragmocone positioned above the body chamber, presumably for stable buoyancy. I like the clues to the early history of this conch after death. The chambers are entirely filled with sediment, a fossiliferous micrite. You can see places where the original shell was broken and larger bits infiltrated, like the whole brachiopod shown above. This brachiopod appears from its cross-section to be a pentamerid. Also visible are strophomenid brachiopods and gastropods. Rousseau Hayner Flower (1913–1988) described Goldringia in 1945. He doesn’t directly say who he named it after, but he thanks “Dr. Winifred Goldring of the New York State Museum” in the acknowledgments. We can tell Flower’s story later (and it’s a good one), but this gives us a chance to introduce Winifred Goldring (1888-1971). She was the first paleontologist to describe the famous Gilboa fossil flora (Devonian) in upstate New York, and she was the first woman State Paleontologist of New York (or anywhere, for that matter). (Now there is Lisa Amati in this prestigious position. Congratulations, Lisa!) Goldring grew up near Albany, New York, one of nine children in a very botanical family. She graduated from Wellesley College in 1909 with a bachelor’s degree in geology (very unusual for a woman at the time). 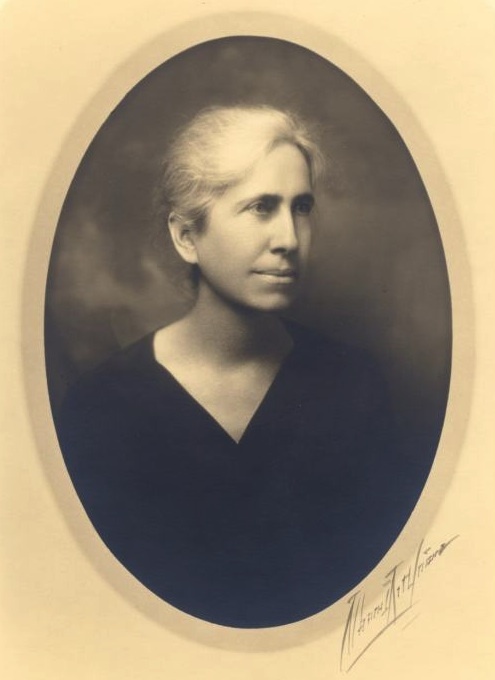 She stayed at Wellesley to earn a master’s degree (1912). She also taught geology courses at Wellesley. In 1913 she studied geology at Columbia University with the famous Amadeus Grabau. In 1914, Goldring joined the scientific staff at the New York State Museum as a “scientific expert”. She worked her way up through the many ranks there to become State Paleontologist in 1939. She is best known as a paleontologist for her work with the fascinating Gilboa fossil forest, bringing her early upbringing by botanists to full circle. Along the way she was the first woman president of the Paleontological Society (in 1949) and vice-president of the Geological Society of America (in 1950). A hero of paleontology. Flower, R.H. 1945. Classification of Devonian nautiloids. American Midland Naturalist 33: 675–724. Goldring, W. 1927. The oldest known petrified forest. Scientific Monthly 24: 514–529. Koninck, L.G.D. 1880. Faune du Calcaire Carbonifere de la Belgique, deuxieme partie, Genres Gyroceras, Cyrtoceras, Gomphoceras, Orthoceras, Subclymenia et Goniatites. Annales du Musee Royal d‘Histoire Naturelle, Belgique 5: 1–333.